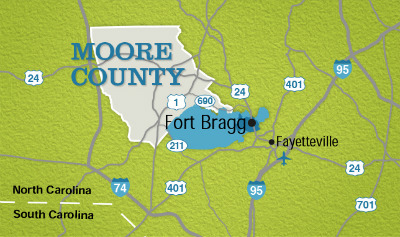 Moore County’s outstanding quality of life and proximity to Fort Bragg, the nation’s largest US Army base, combine to make our area a magnet for military families. Here they’ll find great schools, excellent healthcare, low taxes, tons of great recreational opportunities, and just as important as all the rest, other military families. These families deal with issues civilians may never dream of. Imagine the hardships of having young children when your spouse gets deployed for 6 months or more. To deal with these and other challenges, support systems comprised of friends, neighbors and church families are relied upon to maintain a sense of normal.